We want to increase awareness to this important issue. In order to Live on this earth that we Love that provides us with the Water we need each of us must take action to ensure everyone in the world has access to water. We are dedicated students of the Singapore American School and we wish to share our message of Live Love Water and ask our community to support this important cause. We have created wristbands as a way to show your support. All proceeds will be donated to The Water Project. Direct donations are also welcome through this website. 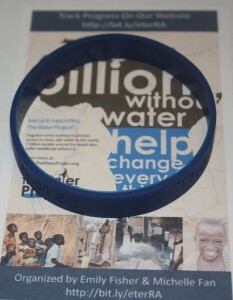 03/11/11 Wristband Donations $39.23 Thanks to SAS students and teachers for continued support!! 03/09/11 Emily Fisher $76.92 the wristbands are a hit!!! More donations!! 03/09/11 Jason Fisher $25.00 Great work girls! !